SP-401 FATO light is a key element of solar heliport lighting system. 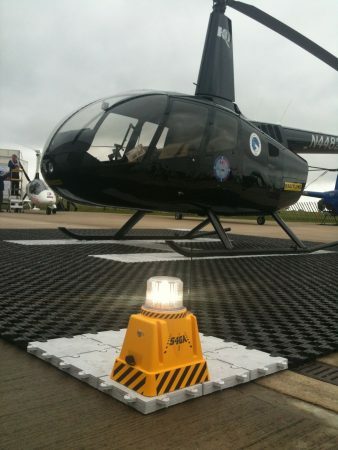 This is a solar-powered intelligent wirelessly controlled helipad light. ICAO-compliant LED optics generates correct light output in terms of intensity and chromaticity. It is NVG compatible LED helipad lights which is often required by military customers. SP-401 aviation light is powered by a standard deep-cycle battery which can be stored locally. Separately installed solar-panel supported by maximum power point tracking ensures high-speed charging. Standard lighting unit is equipped with external military-grad charging port. Separately installed solar-panel supported by maximum power point tracking ensures high-speed charging. Encoded wireless control and monitoring of the lighting unit is using radio transceiver and sensitive antennat. Lighting unit is equipped with external switch and battery level indicator. Those two are used mainly as a backup. Frangible mounting is used to fix SP-401 to concrete or asphalt surface. Helipads are often located in hard-to-reach places where electricity supply is hindered or there is no electricity at all. In such cases, solar lighting works out perfectly. It does not require electricity, and a fully-charged battery can sustain long hours of work. The reliability of such lighting, in line with low maintenance costs and easy installation, make it a good temporary or permanent lighting solution. In the following parts of this article, helipad solar lighting – FATO lights will be presented. The FATO area refers to Final Approach and Take – off area. It is in the shape of a circle, square or rectangle; TLOF zone is designated within this area. This refers to Touchdown and Lift – off area, but it is going to be explained in greater detail some other time. The regulations say that the FATO area should be at least 1.5 times longer than the length of a helicopter. If a helipad is meant for night operations, the following zones should be illuminated: the FATO area, TLOF zone, taxiway and wind direction indicator. The final approach and take-off area needs to consist of at least four white lights which are omnidirectional and give out a 100-candela-intensity (cd) light. They are installed at equal intervals, and the distance between particular lights should not exceed 50 meters. If FATO is dimetric, the lights are put in the corners primarily. Light cases cannot stick out above the helipad surface more than 25 centimeters. Furthermore, if there is a collision threat, they should be installed flat with the surface. As mentioned in the introduction, solar lighting is used in places (but not only) with hindered electricity access. Does it do its job equally well as a conventional lighting? Is it as reliable? How does it work and what makes it special? Let’s provide answers to these questions. The lights used for FATO lighting are a key element of the entire system. Just like all of the lights used in aviation, FATO lights need to meet the ICAO regulations (International Civil Aviation Organization). Moreover, the use of LED lights allows for the proper chromaticity and intensity. Also, they are compatible with night vision devices so they can be used by military helipads too. The best FATO lights can be powered by three independent power sources (a solar battery, charging station, electric current). Special attention should be paid to solar lights’ (including FATO lights’) resistance to extreme temperatures. Standard lights can work in temperatures between -20°C to 50°C. Special lights are capable of working in temperatures from -40°C to 80°C. Talking about Helipads’FATO solar lighting, one should take a closer look at a particular example of such a light. How long can it work after being fully-charged? What is the lifetime of the lightbulbs, and what protection does it include? Let’s see! Prevention from overcharging and complete discharging. 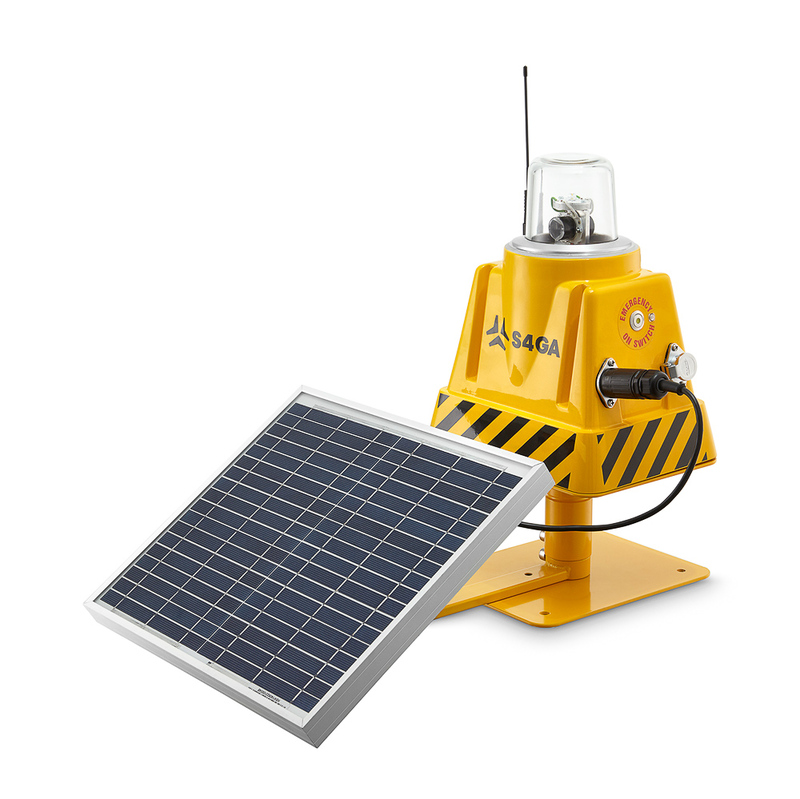 FATO solar lights can be controlled remotely both from the ground or the air. A pilot can also be the operator. Wireless range is 3 kilometers, and it can be extended if needed. Moreover, the system provides an automatic lights control and an emergency on/off switch. Operating time Min intensity 85 hrs. Charging time via charging station 7 hrs. Charging time via solar panel 10 hrs.